The legendary Battleship Mars 33 gun slinger is back. 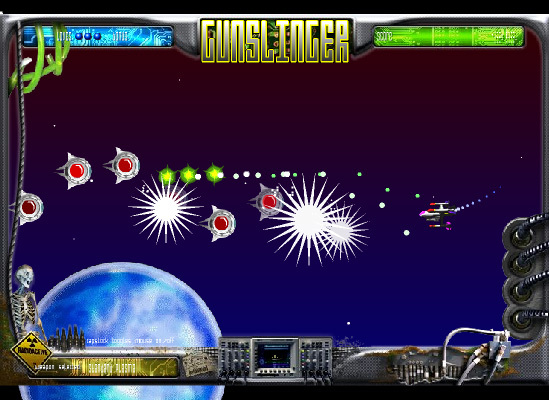 The advanced arcade graphics and sophisticated visual effects pushed Battleship Mars 33 on the top of most wanted free space shooting games ever. Yes it is an arcade game, and yes, it is a free one, and hell yes, it is the best one out there. This extraordinary addictive free shooting game will get you. Go ahead, who knows when it stops being free to download. Finally a free shooting games collection that is really free and all about shooting. There are zillion of websites out there claiming to have free shooting games for you. And it did not take you long to find out they are 90% hoax. By us at free shooting games portal, you really get shooting games absolutely free. That means you can download them to your PC and play them any time. Does that mean that free shooting games can only be played in solitaire mode against PC? Not at all! You can also play them online, in competitions, for money or alone. Depends on the game you download. Specific free shooting games will have option to engage into an online combat directly from the menu. It is your choice what you do with free shooting games once you have them on your computer. It is up to you how you use them, when or where you play them. Qweas is providing links to Free Shooting Games 2.0 as a courtesy, and makes no representations regarding Free Shooting Games or any other applications or any information related thereto. Any questions, complaints or claims regarding this application Free Shooting Games 2.0 must be directed to the appropriate software vendor. You may click the publisher link of Free Shooting Games on the top of this page to get more details about the vendor.